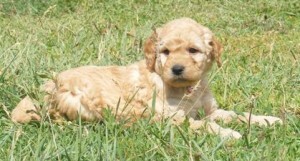 We are a small farm and dog breeder specializing in raising Miniature Goldendoodle puppies. We are located in Washington state about 30 miles north of Spokane, near Elk. Our Miniature Goldendoodle puppies are raised in our home, with our family, and around the farm. We take pride in producing well socialized, healthy, and beautiful Miniature Goldendoodles. Our breeding stock are all members of our family. All of our dogs, including the puppies we raise, live in our home environment. Our Miniature Goldendoodles are involved in our everyday activities, and have all kinds of fun with us. The parents to all litters are all AKC registered, and are excellent representatives of their individual breeds. We hope you enjoy your visit to our web site as you learn more about the Goldendoodle Dog Breed and meet our wonderful canine family members. If you are interested in adding a healthy, home raised Miniature Goldendoodle puppy from Mountain Doodles to your family, please feel free to contact us. We look forward to helping you decide if a Miniature Goldendoodle puppy is the right fit for you and your family.